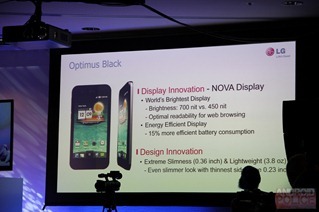 During the LG press conference (see our live coverage), LG officially revealed to the world the Optimus Black Android smartphone, previously known as Optimus "B." This upcoming looker features a brand new NOVA display technology, which LG touts as "breakthrough, brightest, clearest, and most readable among mobile screens, with 700 nits of brightness (Nit: a unit of luminance equal to 1 candela per square meter)." The NOVA display supposedly performs very well under strong sunlight and uses up to 50% less power compared to LCD screens and AMOLED screens that are displaying a totally white image (AMOLED doesn't use energy to display blacks). If this is indeed true, it should do wonders to LG Black's battery life, which, by the way, is going to be 1500 mAh. Super AMOLED who? Next up, we have the claim that LG Black is the world's slimmest smartphone, at least in its thinnest spot - just 6mm, with 9.2mm being the thickest. It weighs 109g (3.8oz), which, compared to my EVO's 170g (6oz) is very impressive. CES seems to be all about thin - Samsung, Sony, LG, and everyone here are all introducing very slim devices, which makes me very happy. LG Black features a 2MP front-facing camera, which is supposed to be world's first as well. A lot of firsts today for LG - impressive. No word on the processor, but it is safe to say it will not be dual core - that's what Optimus 2X is for. The phone will ship in the first half of 2011, with LG's Optimus UI 2.0 on top of Android 2.2 (they just have to keep doing this, don't they?) and will be upgradeable to Android 2.3 (Gingerbread) later. LAS VEGAS, Jan. 5, 2011 – LG Electronics (LG) announced today it will unveil a new Android smartphone, LG Optimus Black, at the 2011 International Consumer Electronics Show (CES) from January 6th in Las Vegas. Providing users with a dramatically brighter 4-inch NOVA display in the world’s slimmest 9.2 mm mobile device, LG Optimus Black creates a one-of-a-kind user experience unlike anything before. Available for the first time in the mobile market, LG Optimus Black’s NOVA display is designed to be the brightest, clearest and most readable among mobile screens with 700 nits of brightness for optimal visibility. LG Optimus Black provides users with an easier and more natural experience when browsing the web, reading emails, or writing documents with higher levels of brightness and pure white tones that deliver true black and white colors for ideal handset viewing. 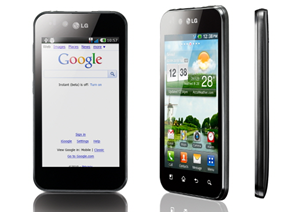 NOVA technology featured on LG Optimus Black also enables users to maintain visibility whether indoors or outdoors under strong sunlight. 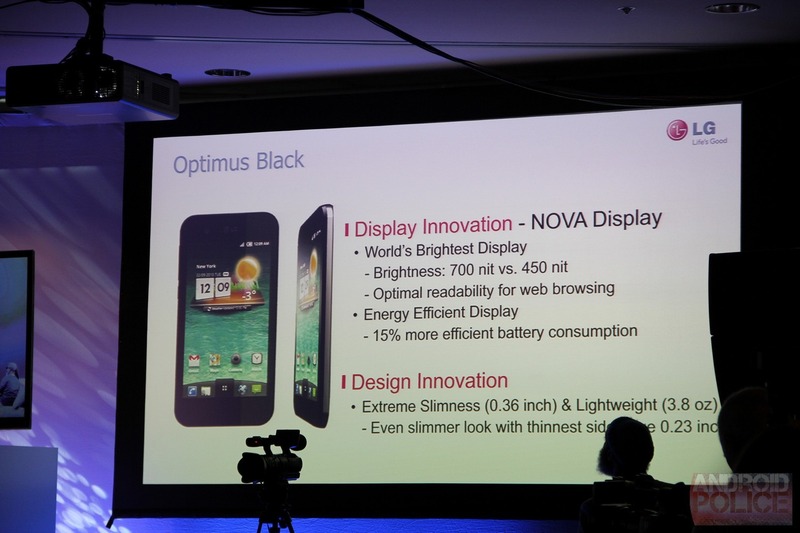 In addition to greater luminosity, the NOVA display on LG Optimus Black also radically reduces power consumption by 50 percent during general indoor use compared to a conventional LCD. Similarly, AMOLED consumes twice as much power as NOVA to display a full white screen, the most frequently used color scheme for web browsing. Combined with the 1500 mAh battery of the LG Optimus Black, users will have enough power for their daily needs, even at maximum brightness settings. Users will never be out of style with the LG Optimus Black’s ultra slim 9.2 mm design. Making a strong visual statement, LG Optimus Black weighs only 109g and offers sleek lines and smooth edges that improve handheld grip. Tapering down to the world’s thinnest smartphone profile of 6.0 mm, LG Optimus Black’s subtle back arch helps to create the illusion of even greater slimness. Unique to the LG Optimus Black, the flush and flawless finish of the front display is achieved by innovatively hiding the Invisible Receiver behind the edges of the phone.